After 35 days of a partial government shutdown, President Trump announced on Friday that he would support a short-term continuing resolution that would fund the federal government through February 15, restoring funding to programs like WIC. House and Senate leaders worked swiftly to approve the resolutions, and the government was reopened on Friday evening. Federal workers should be returning to work today, with agencies instructed to prioritize issuance of back pay by the end of the week. The short-term measure was initially proposed in December, before the shutdown even began. At the time, President Trump withheld his support to obtain leverage in negotiations about a border wall. When Democrats took power in the House midway through the shutdown, House leaders advanced several appropriations bills that would reopen the government. Senate Majority Leader Mitch McConnell (R-KY) prevented these measures from seeing a vote in the Senate. Instead, the Senate held two votes last Thursday - one on Trump's proposal and one on a short-term measure - but both failed given mixed signals from the White House. The short-term measure only moved forward after the White House suggested that the President would sign the bill. Congressional leaders must now negotiate a compromise on border security to advance the Homeland Security appropriations bill before the February 15 deadline. It is possible that other appropriations bills - including the Agriculture appropriations bill that funds USDA and WIC - can move separately from the negotiations around border security. Should Congress fail to reach an agreement, it is possible that we may enter another partial government shutdown that could affect USDA funding. The White House has also signaled that it is considering declaring a national emergency to divert funding toward a border wall, although Republican senators are openly criticizing that strategy. NWA will continue to update members on the status of the Agriculture appropriations bill during the three-week negotiation period. The partial shutdown lasted for 35 days, but WIC agencies were able to sustain services despite the lapse in funding. USDA's efforts to reallocate over $600 million in federal funds ensured that all agencies could continue to operate into February. WIC agencies served furloughed federal employees throughout the shutdown, who faced difficult choices as they went without two paychecks. Even though clinic doors remained open, WIC agencies had to combat misinformation and confusion as families scrambled to find adequate resources to meet their basic needs. NWA appreciates the diligent work of WIC agencies to correct the record and work with retail partners and other stakeholders to reinforce the message that WIC remained open throughout the shutdown. Although the shutdown is over, we'd like to request you please share stories on how the shutdown impacted your state/local agency or your participants.These stories are powerful tools to us as we advocate for the WIC program on the Hill and to the media. Please share any stories, anecdotes, or reflections with Natalie Mulloy at nmulloy@nwica.org. 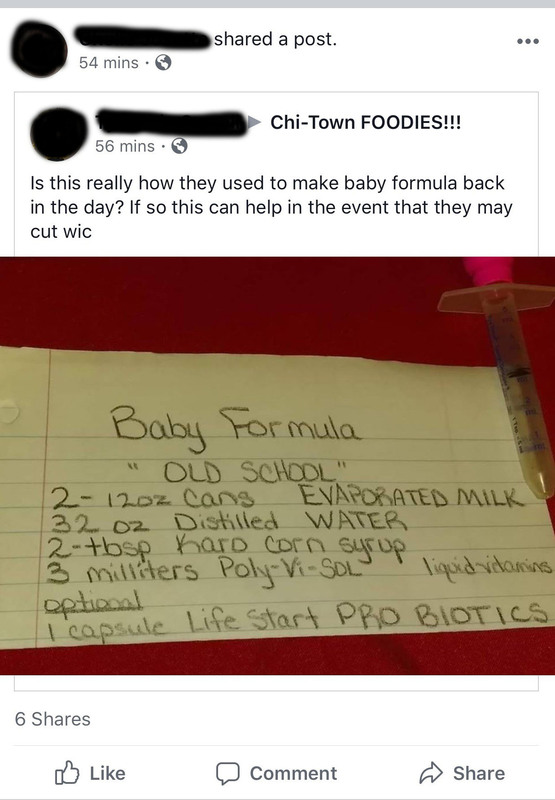 Perhaps the most disturbing report centered on homemade formula recipes, as families on social media questioned whether they would continue to be able to obtain infant formula through WIC. Federal guidance makes clear that homemade infant formulas are not safe. Pediatricians likewise recommend that families obtain regulated infant formula, as even a few weeks of inadequate infant nutrition could have lifetime impacts on that child's development, and improperly prepared or over-diluted formula can result in infant death. This fear underscores the severity of the shutdown; even though WIC was able to remain open, the loss of WIC services to a family could have catastrophic impacts on infant and child health. The shutdown also has a significant impact on SNAP recipients, as families received early issuance of February benefits in mid-January. Barring additional USDA action, SNAP recipients will not receive additional benefits until at least March. This early issuance raises concerns that families will face a gap in being able to afford food purchases, and food banks are raising the alarm that they do not have capacity to meet the need. NWA worked to get the message out to the media that WIC is open. We have given a number of interviews to national news outlets. Since the last Monday Morning Report our President & CEO, Rev. Douglas Greenaway, was interviewed on MSNBC, and featured in this USA Today article "Government shutdown 2019: State, local officials feel the pinch. 'We are at ground zero.'" Amid various efforts to end the shutdown, the Senate unveiled new legislative language last week that could guide a final spending package for USDA. The Senate's report includes strong language against USDA's plans to relocate and reorganize the Economic Research Service (ERS) - a vital USDA agency that conducts the nation's food security research and program evaluation for nutrition assistance programs like WIC. The report language questions the justification for relocating ERS outside of the National Capital Region, a step that could lead to staff turnover and loss of critical expertise. The report also criticizes USDA's efforts to reorganize ERS under the Office of the Chief Economist, a move that threatens the independence of ERS from political decision makers and undermines the credibility of the agency's findings. While the report language does not carry the same weight as legislative text, it is a clear sign that members of Congress are concerned with USDA's actions. NWA has actively worked to educate members of Congress about these proposed actions and will continue to push for solutions that maintain investment and independence in the country's nutrition research.